Would you like your teen to lose weight? Today’s children are more likely to die at a younger age than their parents due to obesity and the health issues that tag along with it, such as diabetes and heart disease. Childhood obesity is a real problem, and it is still on the rise. Though the United States has a reputation for having too many overweight kids, the epidemic is now widespread in many other countries, such as Greece, Mexico and China. If you are a parent and you would like to help your son or daughter drop inches off his or her waistline, seriously consider a military summer camp. Not only will your child lose weight, but he or she will receive other benefits. Below are six reasons you should choose a military summer camp for your weight-challenged teenager. Military camps help teens lose weight. Campers exercise, march and participate in activities that keep them moving all day long. Campers eat three square meals a day, and their meals normally include servings of meat, vegetables and, yes, even starches. Though they eat as much as they like at mealtime, the campers burn off an incredible amount of calories due to their high level of physical activity. According to SgtMaj Ford Kinsley, director of Marine Military Academy Summer Camp, it is not unusual for heavy campers to drop 10-15 pounds in four weeks. “The boys don’t even diet. It helps that they don’t snack between meals, but the main reason the pounds melt away is all the exercise they get,” SgtMaj Kinsley said. Military camps promote lifelong fitness. Campers typically wake up each day at 06:00 (or 6 a.m.) for physical training. In addition to morning exercise and marching, campers must also participate in sports and outdoor events. Whether it is rope climbing, rappelling or mud diving, the activities increase the strength and stamina of the campers as they have fun. Movies, video games and other “couch potato” activities are extremely limited. SgtMaj Kinsley meets many student athletes at his camp. “They want to run the obstacle course and do the adventurous military stuff, but they also want to get in shape for football,” he said. Military camps improve self-confidence in teens. It comes not from the weight they lose or the muscles they gain but from the mental boost they get from conquering obstacles. The Stairway to Heaven, for instance, is an intimidating obstacle course event. Many campers are initially scared to climb up and over it. The campers, however, are taught to face their fears and begin climbing. With every step, they grow a little more secure. When they finish, they are not only relieved but very proud of what they accomplished. “Every challenge brings a win, and every win builds more self-confidence,” SgtMaj Kinsley said. Military camp helps teens develop self-discipline. Each day, campers must wake up early, exercise, make their beds, clean up their rooms and participate in a full day of activities. The tight structure, full schedule and strict rules are not meant to take the fun out of camp but to create self-discipline. Individuals with self-discipline have a greater chance of being successful because they take initiative and do not have to be prodded or reminded to start or finish things. Self-discipline is also not as hard as most people believe. Military camps teach teens how to focus. The camps do this by removing or limiting distractions. It is not uncommon to prohibit or restrict the use of cell phones, tablets and other electronic gadgets. When people “unplug,” they pay better attention and think more clearly. Campers particularly need to concentrate when they enage in teamwork challenges, which require a great deal of problem-solving and communication. According to SgtMaj Kinsley, “shutting out the noise” helps all campers learn more, do more and enjoy themselves more. “We teach the boys that with a lot of focus and a little effort, you can take care of business in a short amount of time. Then you’ll have more time for fun,” SgtMaj Kinsley said. Military camps teach teens good manners. “Yes, sir,” “May I,” and “Thank you” are words that are heard at camp. Opening the door for someone or helping someone carry items are polite gestures that can be seen. Campers are taught to show respect and courtesy to those in authority as well as their fellow peers. Good manners remind people to think about others and not just themselves. Military camps place a great deal of emphasis on teamwork, which is another reason why good manners are so important. “No one wants to help or work with a person who is rude or disrespectful,” SgtMaj Kinsley said. A military summer camp will not only help your teenager lose weight, it will introduce fundamental skills your son or daughter needs for future success. As you explore summer camps for your child, skip the descriptors “weight loss” or “fat” and be sure to type “military” in your search engine! 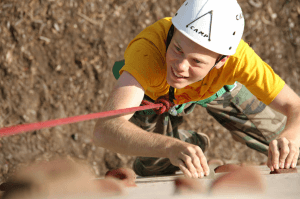 Marine Military Academy Summer Camp is a military adventure camp for school boys ages 12-18. For more information, visit MMA-TX.org/SummerCamp.